This year’s HOPE Day of Service, which took place on Thursday, August 13th , was an opportunity for students entering the Miami Law community to give something of themselves before they give everything they have to their casebooks. 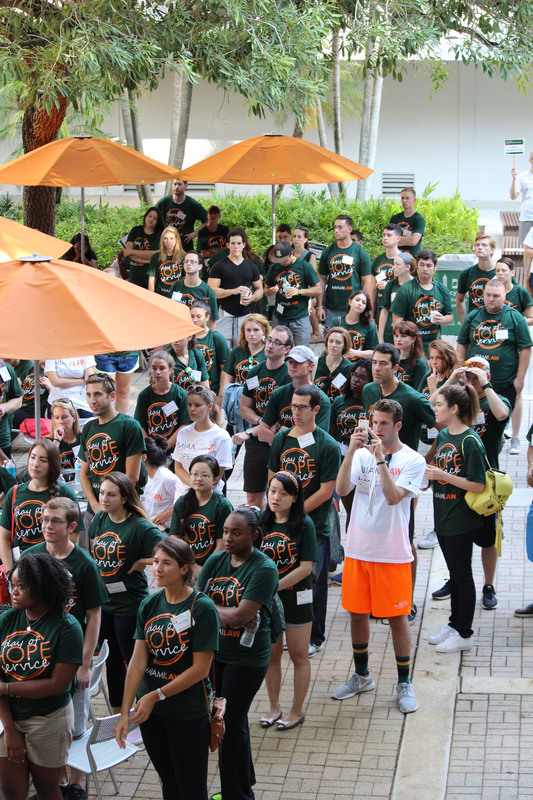 The 17th annual HOPE Day of Service is where Miami Law demonstrates its emphasis on public service by sending its newest students out into the community to give their time and energy to helping those in need. This year approximately 300 students, including second and third year student site-leaders, gathered on the Hillarie Bass Bricks for coffee and bagels. There, Dean Patricia White remarked that despite the poor reputation lawyers carry in jokes and folklore, being a lawyer is a profession of service. This idea is central to Miami Law’s commitment to a pro bono ethic and was a theme for the entire day. Sixteen sites were featured in this year’s HOPE Day, allowing students to pick generally what type of volunteer work they wanted to do. Miami-Dade Animal Services, the Homestead YMCA, Ronald McDonald House, and the Virginia Key Beach Park all received large group of students, as they descended on their chosen sites in their matching green HOPE t-shirts. Working outside gave some of the northern transplants a chance to get acclimated to the tropical humidity of their new home. One such venue was the native plant nursery belonging to Citizens for a Better South Florida, an organization dedicated to improving the sparse urban tree cover in lower income Miami-Dade communities. The organization has a home nursery where they grow native plants from seeds to be distributed to communities that need them. This is where students had a chance to get their hands dirty sorting seeds, weeding beds of native plants, and clearing fallen foliage. Coupled with a healthy dose of environmental education, students left the site feeling connected to the community they were serving. Ultimately, the students seemed to relish their new role in the community. “Volunteering at the Tropical Audubon Society made me appreciate the South Florida environment,” said Julianne Burch. Aline Gomes Noguiera felt that her time spent at the tropical Audubon Society made her feel “useful and part of the community.” These thoughts from the participants helped underscore Dean White’s message on the Bricks that morning - that as lawyers it is important to learn how to give of yourself and shoulder the responsibility that comes with learning how to practice law in this community.